So, I've been knitting a lot lately. I made my father some socks for Christmas, there's an oversized cardigan in the works, I have plans for more socks, hats and sweaters and I finished a scarf! This yarn was one of those purchases that got the 'you bought something that matches your hair again' comment from the boyfriend, and he wasn't wrong at the time (I've gone a bit greener since then). 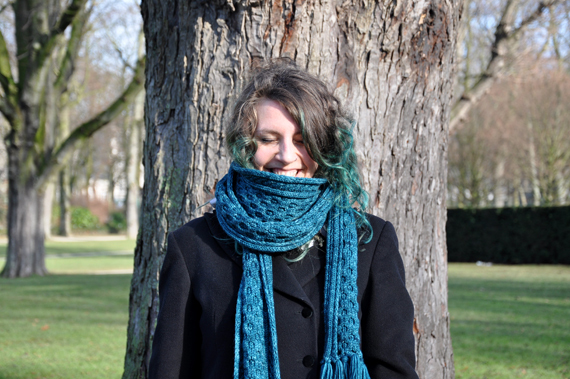 It's Malabrigo Rios yarn in Teal Feather (I think) and it was amazing to knit with. It's 100% merino wool, so super soft as well. I think my face in the above picture says enough. I have used the worsted version of this yarn in the same colourway to make a hat before, so now I have a (somewhat) matching set! But what about the pattern? 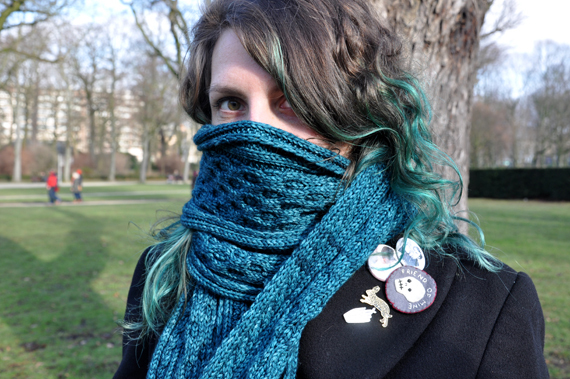 What if I said this scarf was vaguely based on a scarf worn by Remus Lupin for like, one scene in Prisoner of Azkaban? I can't even find a decent picture of the original. Someone had written a pattern for a scarf like this but I can't deal with written cables and just trying to read this gave me a headache. In the end I simplified the pattern to the max, used Stitch Fiddle to make a chart and went to town. The pattern is not that complicated and was easily memorized. It's basically two cabled rows (mirrored) on either side and a honeycomb panel in the middle. I worked on and off on this for a few months, but all in all it was done surprisingly quickly. I definitely got faster as a knitter! 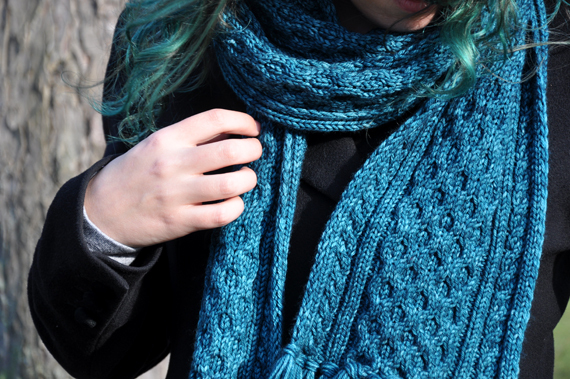 I had four skeins of this yarn, and used almost all of it, so this is a long scarf! 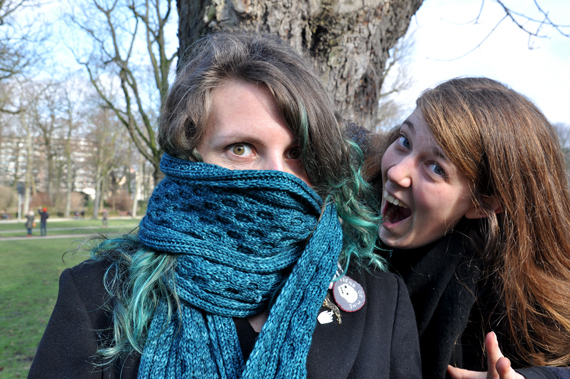 This scarf has been keeping me warm and toasty the past few cold days, and my friend Charlotte seems to approve as well! PS: Curious about the title? It's from this werewolf song. Floral Skirts and No Dog Poop in Sight!